Nature's Technology - About Us - Nature's Technology Landscape & Design, Inc. Nature's Technology Landscape & Design, Inc.
Sandra Stockman, Owner of Nature’s Technology is a long time resident of the Winter Park area. She is a Florida Native and wouldn’t have it any other way. Sandy has always had a natural born passion for the outdoors and all its beauty. At an early age, Sandy found her talent to be in Landscape Beautification. She worked hard and strived to be the best she could be in her new found ability to turn the ordinary into extraordinary. After working for other companies and having her talents move them in the right direction, she decided to move herself in the right direction. In 1985 she opened the doors to her own company called “Nature’s Friend.” After being in business for two years, she decided to change the name to “Nature’s Technology” and from that point forward business continued to grow. Sandy’s need to be a perfectionist has put her at the top of her game and her customer base proves it. Nature’s Technology has received several awards for Landscape Design and Installation. Nature’s Technology has been featured in Southern Living Magazine’s 2005 issue. Most recently, Nature’s Technology received the Winter Park Beautification Award in September 2010. The level of care and attention to detail that is put forth in all of our designs, installations, and services is unmatched in the Central Florida area. As the Owner of Nature’s Technology, Sandy is not opposed to using volunteers to help with City projects such as the restoration project at the Historical Casa Feliz in Winter Park, FL. She has also used volunteers to assist in the Phase I project at the Depugh Nursing Home also located in Winter Park, FL. Sandy is very passionate about bringing the community together to help with these projects as it helps keep the community beautiful as well as keeps our history alive. Nature’s Technology has also participated in a multitude of historic home renovations, church installations, and wedding chapels in the Central Florida area. Proudly Servicing: Altamonte Springs, Apopka, Casselberry, College Park, Heathrow, Lake Mary, Longwood, Metrowest, Oviedo, Sanford, Tuskawilla, Windermere, Windermere, Winter Park, Maitland, Winter Springs, Ocoee, and the Greater Orlando area. Please contact us for your FREE Consultation. 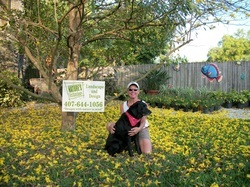 Sandy will personally meet with you to discuss your landscape needs.